It has been a busy fall semester for both College Democrats and College Republicans leading into Tuesday’s midterm elections. The two political parties have long gone back and forth at Catholic University, facing off in a kickball game on Sunday, October 28 on the Law School lawn. The Republicans won the kickball game, however the Democrats said that it was a competitive game. The student organizations have been very active this year, helping out with Halloween on Campus, hosting numerous events on campus, and doing lots of campaigning. Both sides have spent time campaigning and going to rallies, and both held watch parties to celebrate their hard work Tuesday night.Many College Democrats even went to Pittsburgh for a canvassing trip organized by the organization Swing Left to campaign for United States House candidate Connor Lamb last weekend. The College Democrats set up tables and meetings to get people to show up to the watch party. They handed out cups, flags and stickers. There has been a noticeable effort in their attempt to get people to show up to the party. Justin Barquet, the President of College Republicans spoke about the effort that goes behind campaigning. Barquet helped with deployment for canvassing and with campaigning. 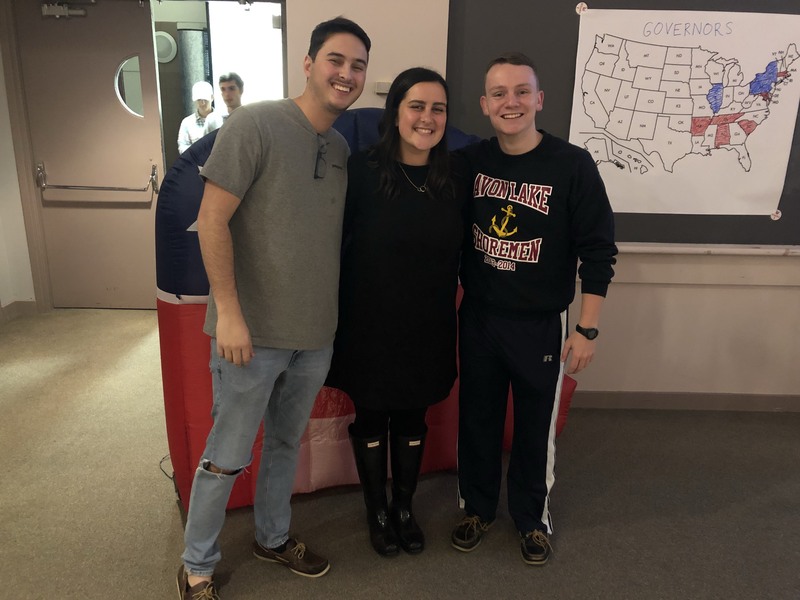 College Republicans took part in the campaigns for Representative Barbara Comstock (R-VA), Representative Jason Lewis (R-MN), and Republican Governor Larry Hogan in Maryland. They got several emails in regard to other campaign trips that students went on individually, due to funding limitations that did not allow a large group of students to attend. They did phone banking for Nevada, Wisconsin and Connecticut representatives. A lot of political organizations want young people to get involved, but communicating schedules, transportation and campaign information was a lot of effort on the student’s part. Going door to door took a lot of behind the scenes effort and phone banking had to be done off campus in peoples off campus housing. Watching the races unfold Tuesday night was very exciting for these groups. Many politics students come from all over the country to study in our nation’s capital, so they were invested in their races back home. Marie Erickson, the President of College Democrats, even had the opportunity to campaign in Pittsburgh, Pennsylvania where she is from. Pittsburgh was the only overnight campaign trip for both of these groups. College Democrats got to meet Jennifer Wexton herself, who ended up winning the Virginia District 10 seat over incumbent Comstock. They took part in biweekly phone banking for races which students attended off campus. The College Democrats watch party took place just up the hill in Aquinas Hall where more than 50 students in the classroom full of campaign swag. The group has had a very successful year so far, increasing their membership. College Democrats received an overwhelming amount of requests for them to phone bank as well. Erickson spoke to the importance of phone banking saying how important conversations are in politics.